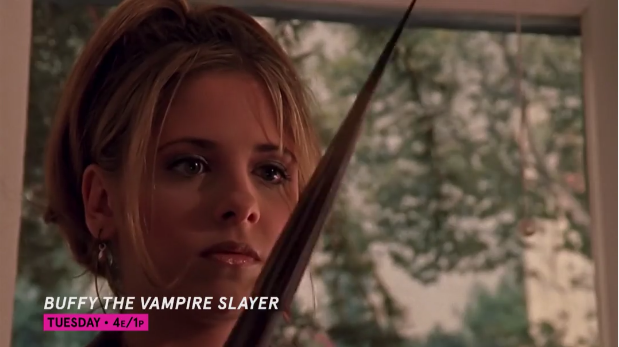 The U.S. cable channel Pivot will begin showing “Buffy the Vampire Slayer” in high-definition starting at 4 p.m. ET on Tuesday, August 26. The show will be broadcast beginning with the first episode in five-episode blocks that will air at different times each day during a given week. The schedule is here, and fans can find their local Pivot channels here. Not every place in the United States has the channel. Aspect ratio could be a deciding factor, but is more of a simple judgment call at this point. Currently, Buffy can be viewed in Widescreen via both iTunes and the Netflix streaming video service, Watch Instantly. Not to mention, the Region 2 and Region 4 DVDs (Europe and Australia, respectively) are presented this way. One could argue for any of those options to be used as source material, but it would be a big mistake. With the exception of the famous musical episode “Once More with Feeling”, Buffy was shot for broadcast television during the late nineties and early two-thousands, the traditional framing format at the time being a more squared, 4 by 3. This is not simply a matter of purity. When the complete series was re-released and re-packaged on DVD as The Chosen Collection, show creator Joss Whedon included a special note to consumers, explaining that Buffy was framed for the “full frame” TV format, and was always meant to be viewed accordingly, meaning you were never intended to see beyond the borders of this industry standard. Before you go crying “foul” and feeling ripped-off, I’d like you to take a look at something. Though Buffy was produced using normal, wide picture film cameras, these devices have preset borders within the viewfinders and display monitors. They’re used to keep the director of photography from “coloring outside the lines”, making for a more centered and TV-friendly picture. Sadly, Amazon.com’s page for the “Buffy” blu-ray set is still barren. So, tell us below: What will be your favorite scene to see in high-definition? Samuel Scott is the founder and publisher of Buffy the Vampire Slayer Online. You can follow him on Facebook, LinkedIn, Google+, and Twitter as well as on his personal website. He is a former Boston journalist and newspaper editor who now lives in Tel Aviv and works in Internet marketing in his day job. Aspect ratio was a crazy reason not to release Buffy in Blu-Ray back in 2010. It’s even crazier today when Star Trek: The Next Generation is out on Blu-Ray in 4:3.